Released in 1996, Beyond the Beyond Original Game Soundtrack is a bit of a misnomer in the fact that this is an arranged album to a soundtrack that never got an official release. Arranged by Motoi Sakuraba, known for his progressive rock work on the Star Ocean and Valkyrie Profile series, this piece offers a nice diverse array of soundscapes, despite its short nature. How does the final product turn out? “To the Promised Land” starts off with a nice dramatic woodwind driven melody with percussion to accentuate this overall feeling of freedom. There are some nice choral highlights in the background and the string section helps to continue what the woodwind melody started. Of course, it wouldn’t really be Sakuraba without some synthesizer action either. The piece transitions into a piano-led melody with some more woodwind and choral accents. Eventually, the piano serves as an accompaniment to the woodwind, but it this section has a very mysterious atmosphere. From the piano section, a more dramatic and dark section arises. Focusing heavily on a foreboding atmosphere, in the form of striking percussion and strings, we are greeted with a progressive rock section. The organ melody creates a very sinister effect, with accents from the chorus highlighting it further. Futuristic synthesizer work is also introduced, creating an almost ethereal nature for this section, while at the same time adding to the drama. Following this section, we are taken back to a more familiar territory in the form of woodwind, string, and choral work, like that heard in the original and the piece finally ends after a reprise of a piano led melody with choral accents, creating that feeling of reaching the Promised Land. The second piece on this album, “Time of Flight,” starts off with a nice woodwind passage that moves into a bouncy piano melody with some acoustic guitar accompaniment to give the feeling of wind blowing in your hair has your flying through the sky. As the piece progresses, woodwind passages move into forefront once more to further create an airy feeling with piano set as the accompaniment. Further into the piece, choir and harpsichord are introduced, giving a dramatic soundscape that is further enhanced with the addition of string and piano section that is chaotic in nature. An organ solo is introduced that only adds to the chaos. Because of these many elements, there is a nice blend of textures in this section. Advancing more into the piece, a woodwind melody with the choir used as an accent in the background, gives it more of an epic feel, as opposed to the airy feel prior. In addition, a foreboding atmosphere is introduced in this piece as well with striking percussion that also uses some flamenco guitar and violin to give it a nice little ethnic flavor. Another improvisation, this time with a chaotic piano solo heavy on the chords, separates another flamenco guitar heavy section. Futuristic synth is introduced once again, providing something that sounds evil and chaotic. At the same time, there is a sense of adventure and holiness about it. It’s a nice contrast and works surprisingly well. The piece reverts back to its origin with a free-flowing, airy woodwind and piano passage. As the piece dies down, choral accents are added once again and a vigorous string passage ensues. Within its last moments, a careful, tranquil harp and woodwind section brings the piece to a dramatic close, as the time for flight seems to have passed. Unlike the previous pieces, “Beyond the World” starts off with a rather sinister aura, portrayed through the use of haunting chorals, chaotic piano, and percussion. As the piece progresses, deeper voices are added before culminating to an impressive organ section which keeps the underlying elements heard before intact. This section relies heavily on improvisation and offers a hint of exploration to the overall sound of the piece. There are also some nice brass and string sections that exude a bit of chaos before into a more melancholy choral section that focuses on deep male vocals, harpsichord, harp, and acoustic guitar. This section offers a nice sense of tranquility from the chaotic start of the piece. As this tranquil section progresses, there is an addition of some free-flowing woodwind work that heightens the overall experience. Continuing with the tranquility, an aura of holiness is portrayed with the addition of some more choral work. Towards the end of the piece, a militaristic-like soundscape is produced with some haunting chorals, deep percussion, brass motifs, and some string work. This ends the piece in a semi-haunting manner similar to the beginning, but slightly less effective. Continuing with the album, “Cruel Wilderness” offers a semi-sinister choir that is balanced with a more playful woodwind. Once we get past the intro, we delve into an area for which I love Sakuraba. Building upon the playful nature, a nice progressive rock section full of organ, piano, futuristic synth, and a catchy bass line ensues, giving this piece one of the most exuberant soundscapes on the album. Improvisation is this piece’s forte and the semi-ethnic synthesizer sound used in the first solo provides a nice textural contrast to the section prior. As the piece continues, that sense of cruelty is exhibited by the organ improvisation that follows. This leads up to a section that uses the same instrumentation heard prior to create a very urgent sound. Most surprising is an interlude that features a music box and some soft, distorted synth in the background to create a strange and eerie atmosphere. As this piece progresses, the synth becomes more prominent and transforms the arrangement into a sinister haunting section before moving onto a more tranquil section. This section emphasizes the use of harp in the accompaniment to create a bubbly feeling while utilizing brass and strings in the melody to create a very airy soundscape. The piece ends with a string section that brings with it a small sense of drama and melancholy with some woodwind and piano sections that bring a sense of happiness and tranquility. I guess we’ve made it to the end of the cruel wilderness! The last piece on the album, “New Journey,” starts with a somber violin line accented with some choral work that gives a sense of holiness. The piano and choir in the beginning create an extremely beautiful soundscape that is only heightened by the addition of some harpsichord and woodwind work. The dramatic percussion leads nicely into a free-flowing piano passage with some sharp woodwind highlights and a subtle choral addition. The thunder sound effects give you the feeling that it is raining and add to the inherent sadness heard within the arrangement thus far. Once the brass synth melody kicks in, the atmosphere is further heightened and the choir comes out in the forefront a bit more. As the piece advances further, the sense of drama is accentuated using all the elements heard prior at once. It’s an extremely beautiful section that leads up to another solo piano section that serves a small, tranquil interlude. The piece continues with the dramatic effects until the end, where it is transformed into another tranquil section that gives a sense of completion. 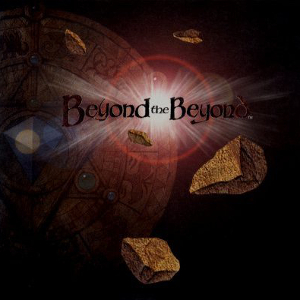 The Beyond the Beyond Original Game Soundtrack is an album that showcases many of Sakuraba’s talents. Whether it is knack for fantastic improvisation, or his ability to create a beautiful or dramatic soundscape, this album has it all. While it is only five pieces, the length of the album is what you’d expect from an arrange album or even a short single disc original soundtrack release. While some might say the album could have benefited from a bit more separation in the pieces, I’d have to disagree with them. Each piece creates a unique experience where the main motifs can be heard throughout the piece. This is truly one of Sakuraba’s finest arranged albums. If you find it, I highly suggest you pick it up. It’s definitely worth the money.